Press Ctrl+Esc to bring up the Task Manager window. The Performance tab is illustrated here. The Task Manager’s Performance tab. The Performance tab lists key resources as thumbnails on the left side of the window. Here, you see two entries for mass storage devices available to the PC. You also see a Bluetooth item. Not all these entries, or perhaps more, will show up on your screen, depending on available resources. To view a different category’s performance graph, choose the thumbnail from the left side of the window. The graph changes over time, scrolling from right to left. The higher the line on the graph, the more the resource is in use or being consumed. The CPU meter tells you how much processing horsepower is in use. Here, the values are low, meaning that Windows isn’t doing much. If the figure were high, or suddenly spiked, that means more activity is taking place, such as a background task or service. The Memory meter tracks how much memory is in use. This item fluctuates as you use programs. For example, running a photo editor may consume a huge amount of memory, but the Performance tab would show that amount of memory freed after you exit the program. Disk items show storage activity. Ethernet shows network activity. On this PC, the Bluetooth adapter is also monitored. If you need further details, use the Resource Monitor. 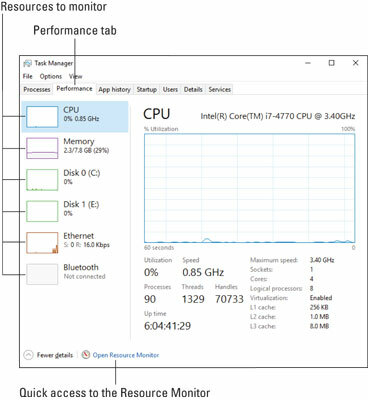 As a shortcut, click the Open Resource Monitor link, located at the bottom of the Task Manager window’s Performance tab.